The problem is good, valuable conversations are incredibly hard to have. Most of the teams i’ve worked with have found it difficult to have successful conversations. In some ways i think thats why so many teams “Doing BDD” jump straight to the tooling. It’s so much easier to write some feature files on your own rather than actually have a conversation. We all spend most of our lives dodging difficult conversations in not only our work life but at home with family and friends. 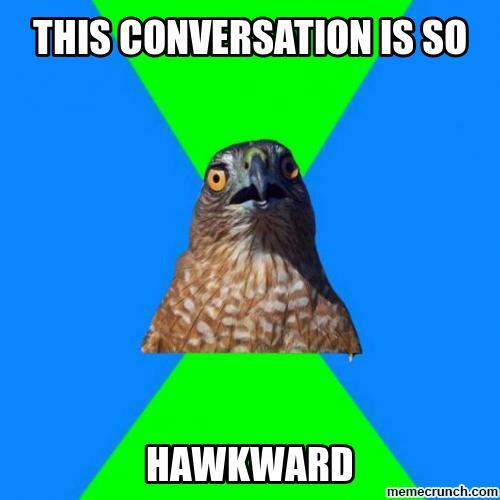 The biggest problem i think with conversations is that they are often emotionally complex. Unfortunately, conversations with the most emotional complexity are the really important ones. Many teams often choose to ignore this emotion and this is where the problems start. It could be the Product Owner who brings an idea to the team but the team clearly doesn’t think its a good idea. However, because of the passion from the Product Owner, the team struggle to have an open and honest conversation. Instead, we move further along the journey and problems get compounded. This has clear alignment to the software we build. If we avoid the crucial conversations, it reflects in the software we build. Maybe the team didn’t believe in the idea, so they built sub standard software because their heart just isn’t in it. Or maybe the team don’t fully understand the idea, but don’t want to appear stupid so avoid having the conversation. So how can we improve our conversations? Good conversations don’t start happening over night. Some of the techniques, mentioned at the start of this post can provide a framework to enable better conversations such as the “Given, When, Then” commonly used in BDD. However, we need to dig deeper to be successful with our conversations. Fundamental to successful conversations is creating a safe environment. So often our conversations are influenced by our work culture. I talked at Agile Testing Days 2015 about the HIPPO (Highest Paid Persons Opinion) In many organisations its not safe to have conversations that challenge the opinion of a senior person. Creating a safe environment where teams can be honest is fundamental. 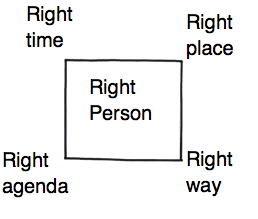 In the centre of the square is the “Right person”. I’m sure we’ve all been in the situation with lengthy calls to customer service centres where we are passed around between different agents hoping to find the “Right person” Its the same in our teams. To ensure success we need to have the right person(s) in the conversation. Luckily the agile approach promotes getting the right people into the conversations. Rather than having conversations in silo’s we are encouraged to break down barriers, something that the Three Amigos technique supports. Finally being more humble in our conversations can help. In Humble Inquiry by Edgar Schein we are challenged to “Ask rather than tell” So often our conversations revolve around “Telling” It could be the Product Owner Telling them what he wants or the team Telling the Product Owner it’s too complex. By shifting to asking “Can you build this?” or asking “Can we make it less complex?” it builds better relationships that lead to more successful conversations. I hope this post helps you to reflect on the communication within your own teams and that the resources i’ve suggested will help you have more successful conversations. My next thought, is “How do you measure the success of a conversation?” Maybe something for a future post.